Stuonobach has recently turned one and if you are yet to visit, then put it down on the to do list now. We actually visited here in Summer for my birthday, and so they had a bit of extra pressure from me to serve us some good food and make sure we had a good night, and they did not disappoint. Located in Steinebach in Dornbirn this restaurant is housed in an old factory site and through the renovations they have managed to create a whole series of spaces, each with their own unique character and mood. This is definitely somewhere to visit for the setting as well as the good food. Outside is a large terrace for those long, warm Summer days and inside there are a warren of adjoining rooms seperated by beautiful archways. We were led through the more casual bar area through to the more formal dining restaurant at the back. The interior decor has been kept relatively simple and clean (yet well executed) allowing the unique and impressive architecture to be the talking point. Sitting in the restaurant you are actually below street level, however they have kept the vaulted ceilings so it is light and airy, yet has a welcoming and cozy feel. If you are looking for an event venue they also have spaces available. Think wood flooring and exposed brick walls. 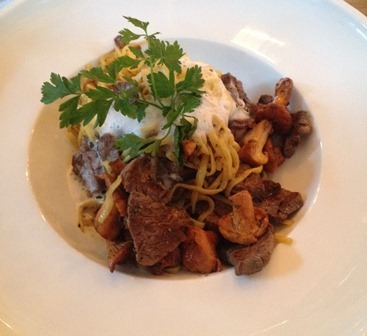 Pfifferlinge season was upon us on at our time of visit and so their specials reflected this and we took full advantage, with Roger sampling their pfifferlinge salad with bacon to start and me their pasta with pfifferlinge and steak strips. For main Roger also had steak on a bed of ristotto with fresh prawns. 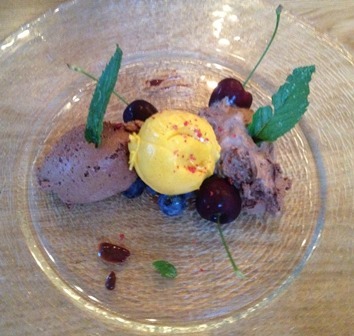 The dishes were well presented and tasted just as good as they looked. The steak was perfectly cooked on both of our dishes and I was really impressed with the amount of pfifferlinge and steak I got in my pasta, and it really was the star of the dish. Our waitress was fantastic and recommended to me a beautiful glass of red to go with my meal, and I must praise her for the patience she had with the table of two elderly women next to us, who took a very long time to decide what they wanted and then changed their minds several times. The whole time she was friendly and helpful and extremely knowledgable about the whole menu and the produce used. 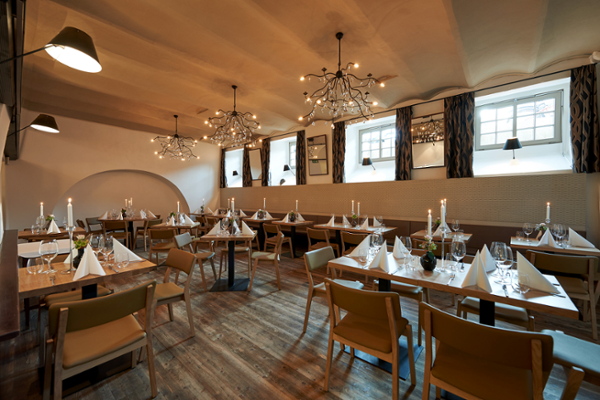 Other menu items include scallops with mushroom ravioli, deer gulasch with almond spätzle and red cabbage, salmon steak and prawns and a range of traditional dishes such as schnitzel and “zwiebelrostbraten”. They also have a pretty impressive daily lunch menu (always including a fish and a vegetarian option) mixing traditional and modern ingredients such as gulasch with polenta, zanderfilet with pumpkin ravioli, stuffed chicken breast with spinach and cheese served with risotto, and braised cabbage with pumpkin served on a couscous loaf (sounds a bit better than the sandwich you bought to work today doesn’t it?). To finish off our meal we ordered their chocolate mousse, which was served on the biggest plate I’ve ever seen for a dessert. Roger did have one complaint about this… it was too much. Rest assured that having too much chocolate, in any form, is not something that will ever come out of my mouth. Other mouth watering temptations were topfen-nougat knödel with stewed plums, or rosemary créme brûlée. They also host regular events such as live music and wine tasting and so whatever takes your fancy and your mood, you will be well catered for. I will definitely be visiting again soon as there is a topfen-nougat knödel with my name on it.